Hello, and Welcome to "Last Unicorn Studios"
"Last Unicorn Studios" was first established in 2004, where "Amy E. Davies" (founder and owner of Last Unicorn Studios) became confident enough to take on the challenge of the model horse business. Although many of the very top artists, have been in the hobby for many more years, her work can be compared to those of the top artists'. Amy became passionate about horses at a you age. The sheer passion is depicted through her attention to detail, despite that fact she only discovered the hobby in 2002. Using a mixed media, including the use of airbrush, acrylic paint, oils, pastels and pencils, Amy can create the perfect replica of a horse, whether it is a portrait or a commissioned custom of a selected colour and markings. If you are interested in placing an order, or would like more information, please feel free to send Amy an email, it's a pleasure. This site has been developed to show case some examples of Amy's work. Commissioned horses will be added to the gallery once they are completed. Please feel free to look around the site. Pricing for commissions can be found on the "Prices Page", which includes a list of scales and colours on which prices vary. Turn around time is a fantastic 1-2 weeks. Please go to the prices page. We offer a complete list of prices for custom paintjob orders depending on the colour, complexity and scale of the model. We include minor prep work in the price. 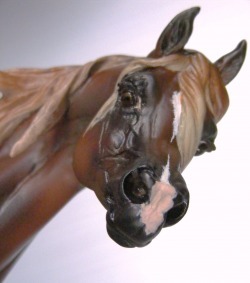 Tack and halter pricing is situated below the Paintjob information, and provides a good guide including pictures and detailed descriptions of the items.